The human brain processes visual information significantly faster than text. Visuals are also more powerful than what we hear. When people hear information, they're likely to remember only 10% of that information three days later. However, if a relevant image is paired with that same information, people retained 65% of the information three days later. If you think about how you move through the world, you won’t be surprised that 90% of all the information that goes to your brain is visual and 93% of all human communication is visual. 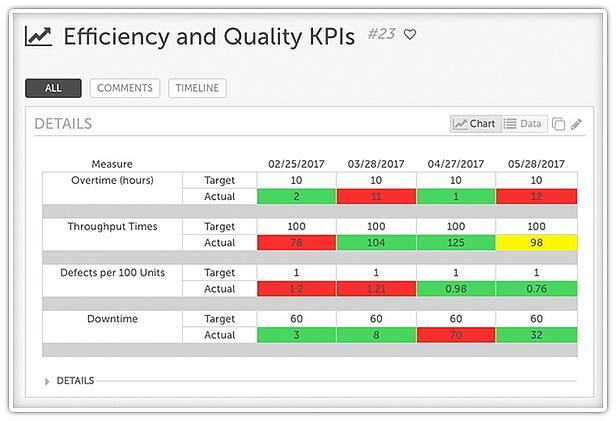 Organizations dedicated to continuous improvement can take advantage of this reality and use visual management to engage staff, provide insight into key information, and help ensure that improvement projects are moving forward as planned. Visual management can be used to support a culture of positive change and spread success across the organization. With today’s technology, it is possible to introduce an improvement management system that makes visualization easy and accessible for every employee. These days, many teams are distributed across multiple locations. Remote work is becoming more common and folks do a lot of work outside of traditional business hours. A digital platform for visualizing improvement projects and results ensures that people stay connected to the work and each other no matter what time it is or where they happen to be. Whenever someone needs information about the state of a project or process, it’s available on any device. Marketers know this. Website pages with images and video get 95% more views than their counterparts with only text. People like engaging with images, if your improvement platform is visual, they will interact with it more often. When employees can instantly understand the impact that improvement work is having on the organization, they become highly motivated to invest effort and emotionally attached to success. One of the most effective ways to spread improvement is for leaders to proactively help remove roadblocks and marshal resources for improvement efforts. Visual management makes it possible for leaders at every level to recognize stalled progress and act quickly to help. Not only are there practical benefits to this type of management, but it also helps underscore the importance of improvement within the company’s culture. A digital visual management platform changes the focus of meetings from updates and explanations to an opportunity for strategic planning and problem-solving. The areas that need focus are immediately apparent to everyone involved, so you can get right to the most important topics. Huddle boards are a popular way to organize meetings. 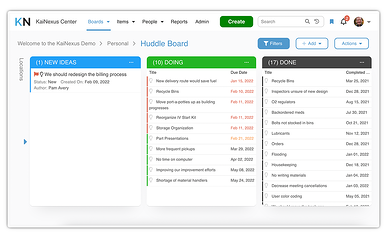 With a virtual system, you get all of the advantages of a huddle board but can involve people who are not in the room. When the same visualization tools are used across the organization, you create a common way of addressing problems, accessing processes, and documenting results. 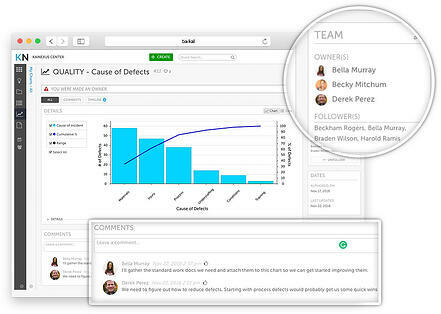 This shared experience for all employees makes it easier to collaborate across department or team boundaries. That’s essential because those touch points between groups are often where the biggest opportunities for improvement can be found. In a culture of continuous improvement, problems are never ignored or swept under the rug. We want problems to be highly visible so that they can be addressed quickly and at the source. Control charts are a great example of this. It is difficult to ignore an out of control process when it right in front of your face. Perhaps the most effective way to expand improvement culture and activities within an organization is to have some big wins. For all of the reasons above, you are more likely to implement successful changes if you leverage visualization. That success will, in turn, lead to more success. Improvement culture really is the gift that keeps on giving.